N wind 14 to 17 kt, with gusts as high as 24 kt. Mostly clear. . Waves 1 ft or less. N wind around 18 kt, with gusts as high as 25 kt. Sunny. . Waves 1 ft or less. N wind around 17 kt, with gusts as high as 24 kt. Mostly clear. . Waves 1 ft or less. N wind 14 to 17 kt, with gusts as high as 24 kt. Sunny. . Waves 1 ft or less. N wind 12 to 14 kt. Mostly clear. . Waves 1 ft or less. N wind around 12 kt. Isolated showers. . Waves 1 ft or less. 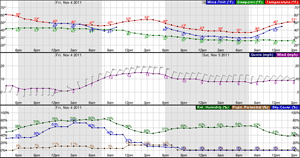 N wind 6 to 11 kt becoming variable and less than 5 kt in the evening. Partly cloudy. . Waves 1 ft or less.